If you’re looking for Chinese food in downtown Calgary, I would not recommend Harbour City Restaurant, instead, I would suggest Regency Palace first, for the exceptional taste alone, and Silver Dragon second, for the best overall experience. (I’ll be sure to write separate reviews on these two restaurants in the near future.) To be clear, I am not saying to stay away from Harbour City Restaurant, it’s not bad. I’m only saying that I wouldn’t recommend it. So when I found myself in Calgary for the holidays, I thought, why not treat my family to some dim sum, and get another review out of it at the same time? 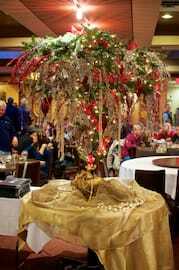 There was no point to calling in advance and making a reservation – while they did acknowledge the reservation was noted in their reservation book, it seemed like they weren’t expecting us at all. We arrived five minutes early (and there were only five of us) but we had to wait more than fifteen minutes at the door while three walk-in tables (of either two or three people) got seated before us. Why make a reservation in advance? The food that did come out was of noticeably lower quality than three years ago. 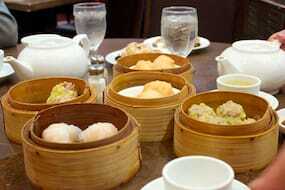 In fact, I remember thinking how even the bargain dim sum at Tremendous was far superior to this. This was completely not the kind of experience I was envisioning when I offered my family to take them out for lunch. I felt embarrassed for taking them to Silver Dragon! A lot of the dumplings were very starchy, the wrappers were too thick and they all fell apart way too easily – a tell-tale sign of mediocre dim sum. 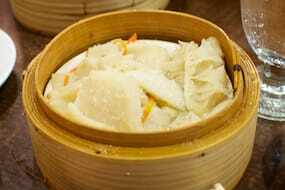 The dim sum was so starchy and poorly made in fact, that we had to use our hands to pry the dumplings apart from each other in the bamboo steamers. The lack of variety in the dim sum that was coming out was apparent to all of us – everything was shrimp plus this or shrimp plus that. We like shrimp a lot, but some more variety would have been nice. 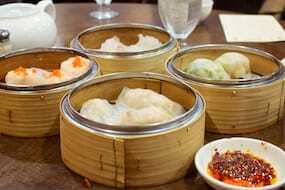 Isn’t dim sum all about variety anyways? The tripe smelled like it was starting to go bad and tasted of being a couple days old. 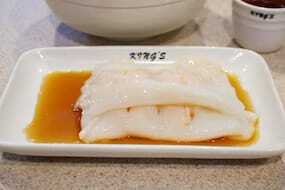 No question about it, this wasn’t fresh tripe, no way. The flavor was also very weak and watered down anyways (it could have used a lot more ginger, more heat/spice, etc.) but that was the same for all the dishes – they were almost to the point of being bland. 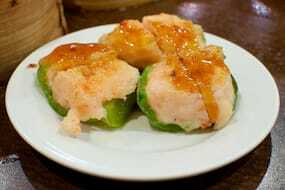 The deep fried shrimp dumplings (not pictured) were good though – probably the only dish that came out decent that day. And now Silver Dragon has taken the honor of serving me the worst looking dish I’ve ever been served in my life. Michelle really likes these rice rolls (stuffed with shrimp) but at Silver Dragon, they looked so horrible, it barely resembled the real thing! You can note a huge, obvious difference in the two photos above. The sad thing is, King’s Noodle Restaurant (where that "nice looking" shrimp roll is from) is a cheap get-in-get-out Hong Kong-style diner in Toronto. And Silver Dragon is supposed to be one of nicest Chinese restaurants in Calgary… Their website brags of "Elegant Chinese Cuisine" but the fact that these rice rolls even made it onto the table of a paying customer speaks volumes. What an embarrassment to Chinese cuisine! It was obvious that no one was enjoying the meal and my family, (who normally eat a lot, if you ask me), weren’t eating very much. I decided to order some mango pudding to end the meal – maybe some sweet dessert would help them forgive me for taking them to such a horrible place for lunch? It wasn’t much help, unfortunately. The mango pudding was similarly watered down – it was a nice touch to have mango chunks in the pudding, but the taste of the pudding was very weak and tasted like they had added a lot of water to it to stretch it out as far as they could. Hm. I was glad to see that Silver Dragon has at least kept up their appearance over the years though – I could see that they’ve renovated the restaurant since I was last there three years ago. The restaurant staff were all in uniforms that didn’t look worn out and the premises looked very clean, tidy and well-kept overall. If only They’d put the same attention into the food! As bad as the food was though, it was the service that was the biggest let-down. One of things that used to set Silver Dragon apart from other places in Chinatown was their quest for achieving service excellence. But such is no longer the case. The most memorable part of our meal, for all of us, was one of the ladies that pushed the dim sum carts – she was unbelievably rude and had so much attitude! She passed by our table during our ten-minute intermission but she didn’t want to show us what was on her cart insisting that it was just "the same stuff as before." When we told her we’d like to have a look anyways (we were hungry, and waiting) she threw the lids off the bamboo steamers with so much attitude, it caught us all off guard. Crazy! it’s very disappointing to see just how bad Silver Dragon has gotten over the past three years. I remember that they used to value their customers but now they very obviously don’t give a damn. A complete 180° from before. When all is said and done, Silver Dragon is very expensive for what you get, and not at all worth the price. If you’re going to charge premium prices, not only should it be much better food than this, but the service should be impeccable. I know dining out prices in Calgary are grossly exaggerated compared to Toronto, but even for Calgary, there’s not a lot of value for dollar here. 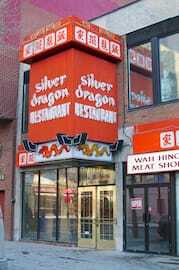 When you consider that our meal would have come out to substantially less even at over-the-top Crown Princess in Toronto, (where the food and service is some of the best anywhere), how do you justify paying so much at Silver Dragon? Indeed, we probably should have gone to Regency Palace instead. The best thing about Silver Dragon is the very nice ambience/decor, but the food was bad, the service terrible and the value horrible. $100 before tip for lunch for five, everyone left unsatisfied, hungry and with a bad taste in their mouth… … This is not the Silver Dragon I used to know. 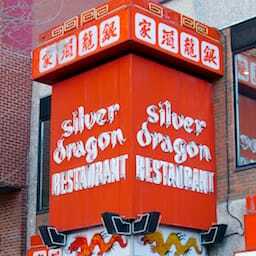 Silver Dragon Restaurant was published on Wednesday, January 23, 2013 at 4:32pm EST by Daniel Menjívar and last updated on April 11, 2018 at 9:30pm UTC .